Dr Mikhail Spivakov has recently joined the MRC LMS to lead the Functional Gene Control group within the Epigenetics section. Plasticity of vascular smooth muscle cells (VSMCs) implicates them in cardiovascular disease progression. Here the authors use lineage tracing and single cell RNA sequencing to identify a rare population of healthy Sca1+ VSMCs which upregulate an activated transcriptional signature shared by disease-associated cells. Image shows Sca1-expressing lineage-labelled VSMCs inside an arterial atherosclerotic plaque. An element of Mikhail’s work at Babraham was a collaborative project with Dr Helle Jørgensen, a group leader at the University of Cambridge’s Division of Cardiovascular Medicine, which was published on 1 November in Nature Communications. This mouse study has shown that it may be possible to detect the early signs of atherosclerosis, which leads to blocked arteries, by looking at how cells in the blood vessels change their function. The findings could lead to earlier diagnosis and new treatments for atherosclerosis in the future. Plasticity of vascular smooth muscle cells (VSMCs) implicates them in cardiovascular disease progression. Here the authors use lineage tracing and single cell RNA sequencing to identify a rare population of healthy Sca1+ VSMCs which upregulate an activated transcriptional signature shared by disease-associated cells. Image shows a tSNE plot with expression of this transcriptional signature in VSMCs from atherosclerotic plaques. Atherosclerosis is one of the most prominent cardiovascular diseases in the UK. It can lead to serious cardiovascular diseases such as heart attacks and stroke, due to the blockages formed in the blood vessels. Coronary heart disease, the progressed form of atherosclerosis, is responsible for over 66,000 deaths in the UK each year . 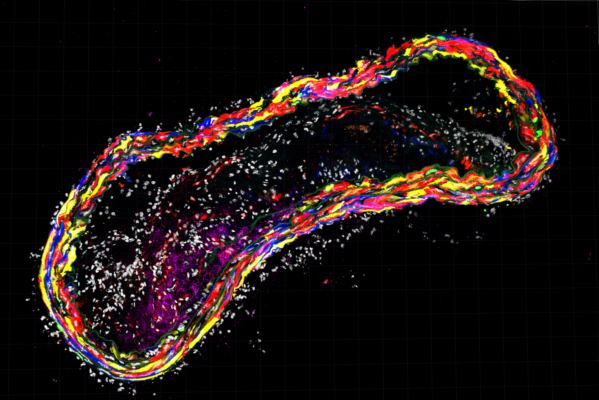 Researchers focused their study on a distinct population of cells that line the blood vessels. The main function of these vascular smooth muscle cells is pumping blood through the body, but they are also involved in ‘patching up’ injuries in the blood vessels. Overzealous switching of these cells from the ‘pumping’ to the ‘repair’ mode can lead to atherosclerosis, resulting in the formation of ‘plaques’ in the blood vessels that block the arteries. Spivakov’s and Jørgensen’s groups have caught a tiny number of vascular muscle cells in mouse blood vessels in the act of switching and described their molecular properties. This research has been made possible by an innovative methodology known as single-cell RNA-sequencing, which makes it possible to track the activity of most genes in the genome in hundreds to thousands of individual vascular muscle cells. “Identifying the populations of cells involved in inflammatory response in the blood vessels is the crucial first step that enables further functional studies in this system. We can now ask what proteins and what DNA elements are involved in switching the cells between the two modes, and what exactly goes wrong with the switching process in disease”, says Mikhail. The full publication “Disease-relevant transcriptional signatures identified in individual smooth muscle cells from healthy mouse vessels” can be read here: https://www.nature.com/articles/s41467-018-06891-x. The research was funded by the British Heart Foundation and UK Research and Innovation. For further information about Mikhail Spivakov’s Functional Gene Control group: https://lms.mrc.ac.uk/research-group/functional-gene-control/. You can also follow Mikhail on Twitter @mikhailspivakov.